NFL star Michael Vick was indicted by a federal grand jury on Tuesday on charges of sponsoring a dogfighting operation so grisly the losers either died in the pit or sometimes were electrocuted, drowned, hanged or shot. The Atlanta Falcons quarterback and three others were charged with competitive dogfighting, procuring and training pit bulls for fighting and conducting the enterprise across state lines. They are scheduled to appear in federal court in Richmond on July 26, the same day the Falcons begin training camp. The operation was named "Bad Newz Kennels," according to the indictment, and the dogs were housed, trained and fought at a property owned by Vick in Surry County, Virginia. On Vick's Web site, he lists his birthplace as Newport News, "a.k.a. BadNews." The 18-page federal indictment, filed in the U.S. District Court for the Eastern District of Virginia, alleges the 27-year-old Vick and his co-defendants began the dogfighting operation in early 2001, Vick's rookie year with the Falcons. The indictment states that dogs fought to the death — or close to it. If convicted, Vick and the others — Purnell A. Peace, Quanis L. Phillips and Tony Taylor — could face up to six years in prison, $350,000 in fines and restitution. Telephone messages left at the offices and home of Vick's attorney, Larry Woodward, were not returned. A woman who answered the phone at the home of Vick's mother said "no comment" and hung up. "We are disappointed that Michael Vick has put himself in a position where a federal grand jury has returned an indictment against him," NFL spokesman Brian McCarthy said. 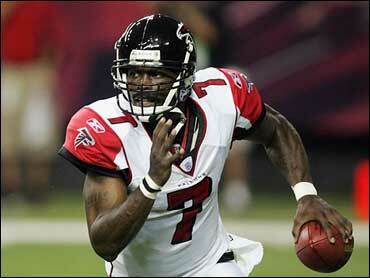 Vick and the Falcons are scheduled to report to training camp on July 25. "Obviously, we are disturbed by today's news," the team said in a statement posted on its Web site, apologizing to fans for the negative publicity. "We will do the right thing for our club as the legal process plays out. We have a season to prepare for," it said. John Goodwin of the Humane Society said the manner in which losing or unwilling dogs were killed was especially troubling. "Some of the grisly details in these filings shocked even me, and I'm a person who faces this stuff every day," he said. "I was surprised to see that they were killing dogs by hanging them and one dog was killed by slamming it to the ground. Those are extremely violent methods of execution — they're unnecessary and just sick." About eight young dogs were put to death at the Surry County home after they were found not ready to fight in April, the indictment said. They were killed "by hanging, drowning and/or slamming at least one dog's body to the ground." — In the autumn of 2003, a person witnessing a dog fight involving one of the dogs trained by Bad Newz Kennels incurred the ire of another cooperating witness by yelling out Vick's name in front of the crowd during the fight. It also said that after establishing Bad Newz Kennels in early 2002, Vick and the others obtained shirts and headbands promoting their affiliation with the kennel. After a police raid on the property in April, Vick said he was rarely at the house, had no idea it may have been used in a criminal enterprise. He blamed family members for taking advantage of his generosity. On June 7, officials with the Department of Agriculture executed their own search warrant and found the remains of seven dogs. At the start, authorities seized 66 dogs, including 55 pit bulls, and equipment commonly used in dog fighting. About half the dogs were tethered to car axles with heavy chains that allowed the dogs to get close to each other, but not to have contact — an arrangement typical for fighting dogs, according to the search warrant affidavit.